Haider Al Abadi, Prime Minister of Iraq, addresses the United Nations General Assembely on September 30, 2015 in New York City. Iraq's prime minister has defended his country's security forces, saying they're capable of defeating the Islamic State group without the help of foreign combat troops. Haider al-Abadi's statement late Tuesday came hours after U.S. Defense Secretary Ash Carter told Congress that a new special operations force will be deployed to Iraq to step up fighting against the Islamic State. The militant group controls a wide swath of Iraq and neighboring Syria. "Iraqi special operations and anti-terrorism forces are playing an important role in the fight against Daesh terrorist gangs and proved their capability in targeting Daesh leaders and carrying out dangerous missions to retake vital areas," al-Abadi said, referring to the IS group by its Arabic acronym. Al-Abadi said his country needs training, weapons and advice from the international community and not "foreign ground combat forces fighting on Iraqi soil." But he left the door open for such a possibility. 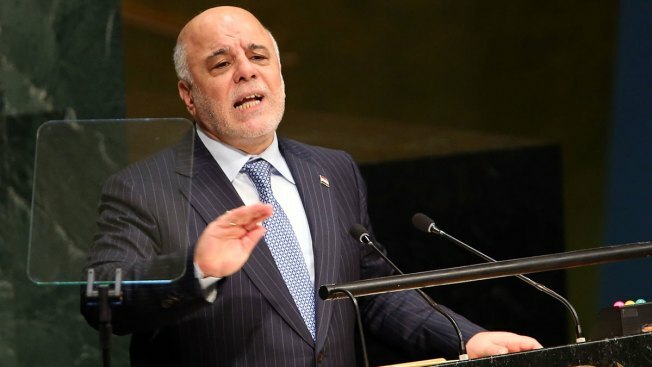 "The Iraqi government underlines that any military operation or deployment of any foreign special or non-special forces in any part of Iraq can't be done without its approval, full coordination and with full respect to Iraqi sovereignty," he said. Carter told the House Armed Services Committee that over time, the special operations force will be able to conduct raids, free hostages, gather intelligence and capture IS leaders. He said the number in the new expeditionary force would be more than 50. It would focus on helping Iraq defend its borders and build its security forces, but also be in position to conduct unilateral operations into Syria. According to a U.S. official, the force could total up to a couple hundred troops, including assault teams, aviation units and other support units. It would likely be based in Irbil, the capital of Iraq's self-ruled northern Kurdish region. The official spoke on condition of anonymity because the individual was not authorized to publicly discuss military planning. Carter said the force might be American-only, but more likely would be mixed with Kurdish troops or others who are fighting the militants. He said the new force would conduct operations similar to two from earlier this year. In October, U.S. special operations troops and Iraqi forces raided a compound in northern Iraq, freeing about 70 Iraqi prisoners who were facing execution. One U.S. service member was killed in the raid, the first American combat death in Iraq since the U.S. began its campaign against IS in August 2014. In May, a Delta Force raid in Syria killed IS financier Abu Sayyaf, yielding intelligence about the group's structure and finances. His wife, held in Iraq, has been cooperating with interrogators. There currently are about 3,300 U.S. troops in Iraq, and President Barack Obama had previously announced he was sending fewer than 50 special operations forces to Syria.